A huge interest in German food already exists in China. 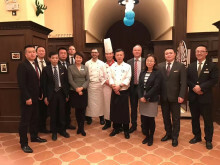 Sebastian Bartels, Maritim Hotel Magdeburg/Germany, is set to reveal the secrets to preparing traditional German gastronomy to his Chinese colleagues at the Maritim Hotel Shenyang. Renowned sous chef at the Maritim Hotel Hotel Magdeburg in Germany, Sebastian Bartels, is set to reveal the secrets to preparing traditional German gastronomy to his Chinese colleagues over the coming weeks at the Maritim Hotel Shenyang, as part of the hotel’s German culinary showcase. A huge interest in German food already exists in China, with sauerkraut and roasted ham hock, washed down with refreshing beer, a favourite enjoyed in the north of the country. Sebastian suspects it may be due to the similarities between the two cuisines, explaining: “Some dishes, such as Chinese dumplings, are prepared exactly the same way in Germany. With a mincemeat or spinach filling, the dish is very similar German Maultaschen dumplings.’’ Inspired by Bavarian heritage, the hotel is also developing a German-Chinese micro-brewery. Situated in the one of the city’s largest business districts, Yuhong, the Maritim Hotel Shenyang is located in the capital of the Liaoning province, widely regarded as the cultural and industrial centre of Northeast China. In addition to the spacious and elegantly rooms, the first class deluxe five-star hotel provides 631 state of the art rooms and suites, a variety of restaurants serving local and international delicacies, indoor swimming pool, fitness centre and wellness area with jacuzzi, steam bath and massage treatments. 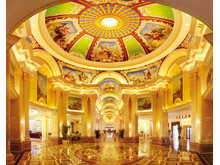 Upcoming food and beverage events organised by the hotel include a wine festival and a Christmas market.